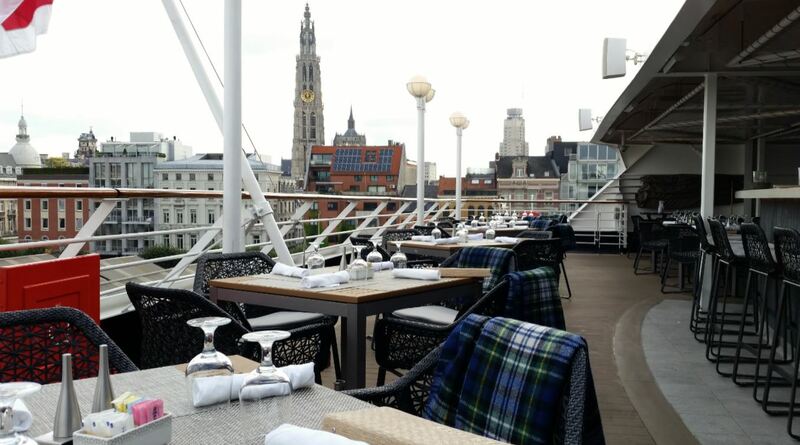 Earlier this year Azamara Journey and Azamara Quest, the boutique-style luxury cruise ships operated by Azamara Club Cruises received a complete transformation from bow to stern. 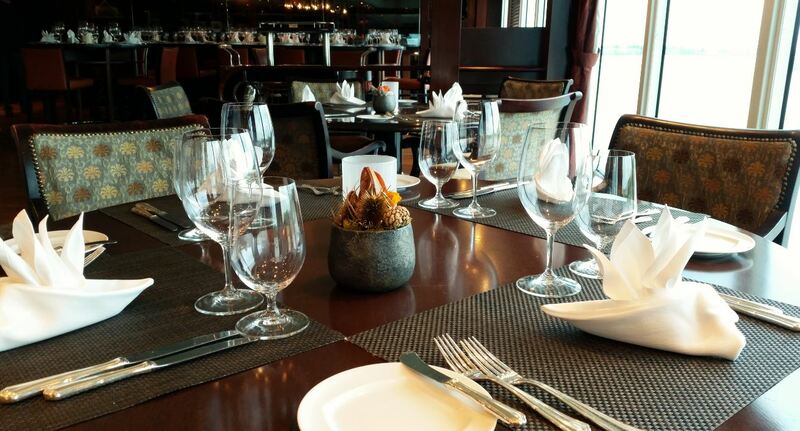 The ships received a whole new interior design inspired by beautiful landscapes, flowing waters and refreshing earth tones, while incorporating modern and contemporary elements. 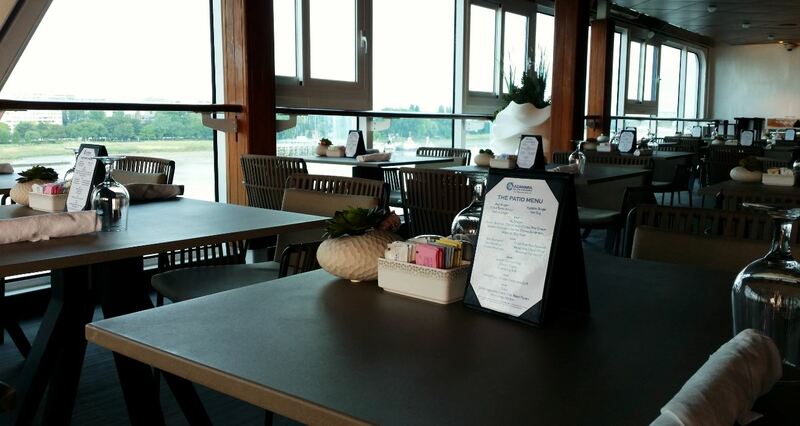 New staterooms and suites, new dining and entertainment areas and new services and amenities were added. 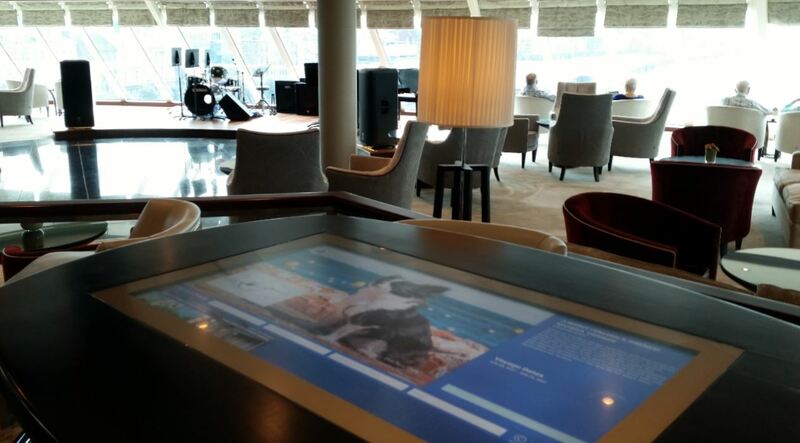 You can learn more about the enhancements by reading our post Azamara reimagined. 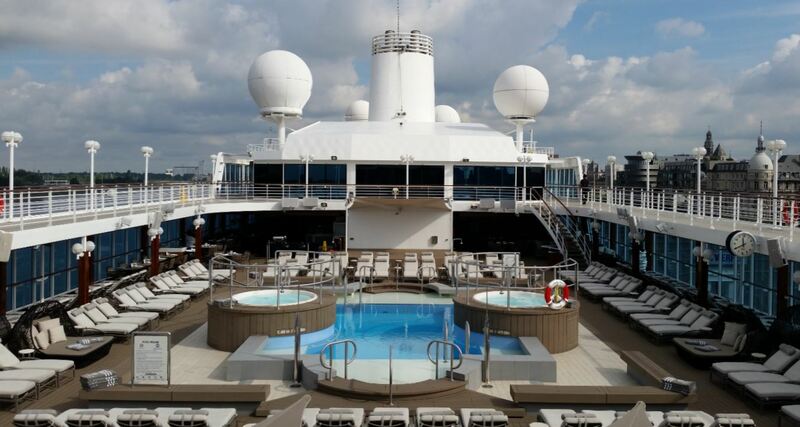 Having been told by other guests on previous cruises that we really should try the luxury service onboard Azamara, but keeping in mind that the upscale luxury of an Azamara cruise comes with a certain price tag, we were in doubt whether Azamara Club Cruises could be a cruiseline for us. 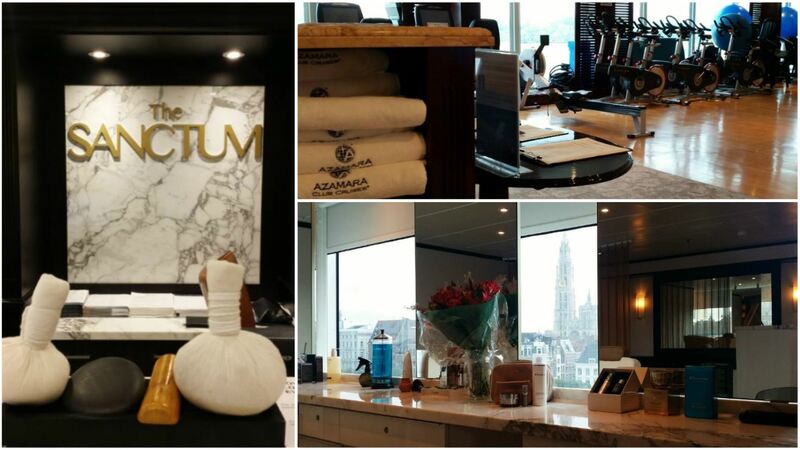 You can imagine our enthousiasm when we were invited to visit Azamara Quest on her maiden visit to Antwerp a few days ago. 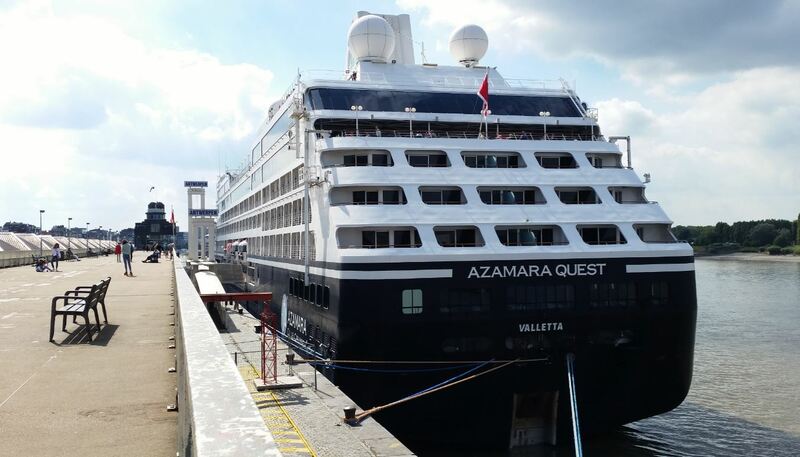 Just like her sister ship Azamara Journey, Azamara Quest is an R-class cruise ship. The R-class ships, eight in total, were originally constructed for Renaissance Cruises between 1998 and 2001. Having been in poor financial health for quite some time, and following the economic decline resulting from the September 2001 attacks, Renaissance Cruises ceased operations at the end of September 2001. All R-class ships are still in operation, Four ships are currently operating for Oceania Cruises, a fifth ship is sailing for Princess Cruises as Pacific Princess while a sixt ship, the Adonia is operating for Fathom, the ‘social impact travel’ cruise line owned by Carnival Corporation. 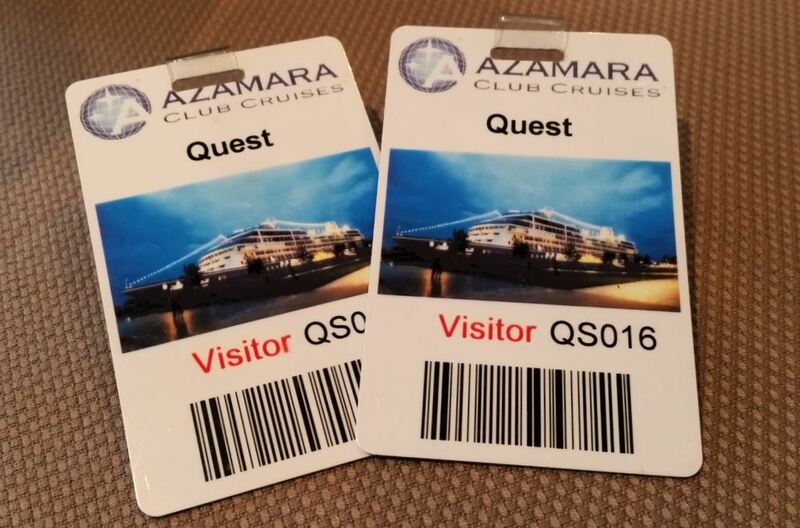 We started our visit to Azamara Quest on deck four where the Guest Relations desk is located. 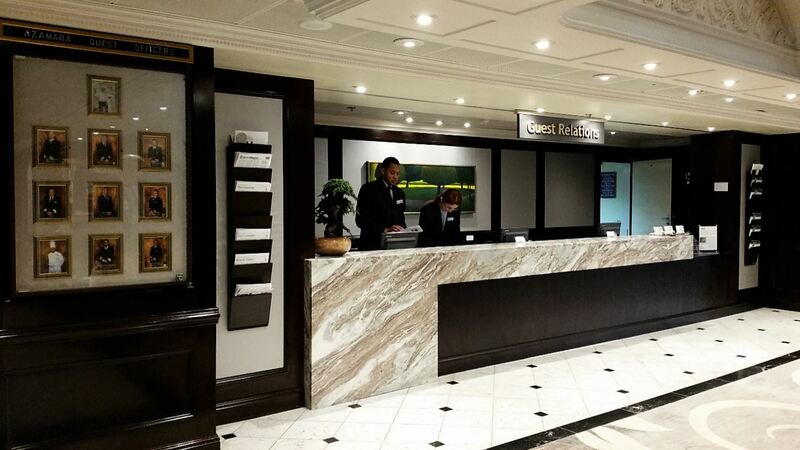 Also located on deck 4 are the Loyalty and Sales office, for all inquiries concerning “Le Club Voyage“, Azamara’s loyalty rewards program, as well as the Concierge and Land Discoveries desk. 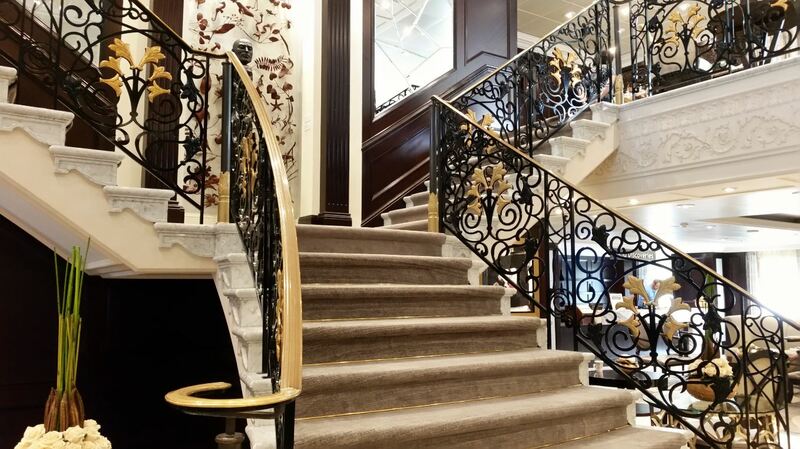 We climbed the elegant marble staircase to deck 5 where we had a look at what was on offer at the Mosaïc Café, Azamara Quest’s onboard coffee corner. As we walked past the Quest Shop, selling last minute casual wear and swim fashions, sunglasses, accessories, music, shipboard keepsakes and other small gifts to take back home, and Indulgences, offering an selection of fine jewelry and watches, we entered the Spirits bar complete with grand piano. Adjacent to the Spirits Bar is the small onboard casino and the Photo Shop selling camera supplies and the portraits taken by the ship’s photographers. 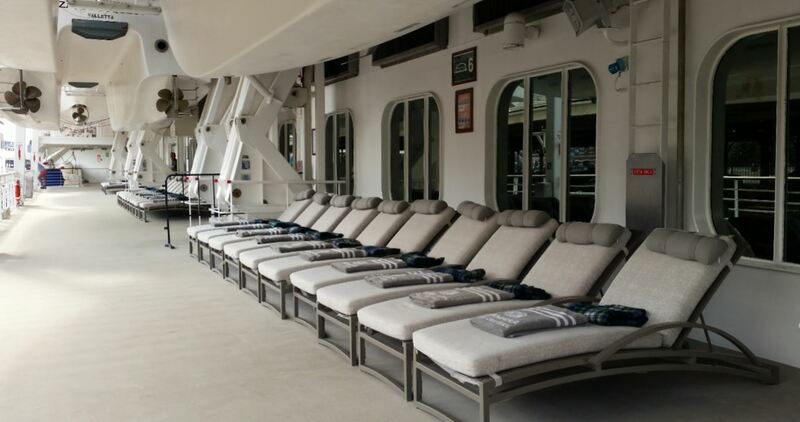 Located at the front of deck 5 is the Cabaret Lounge. 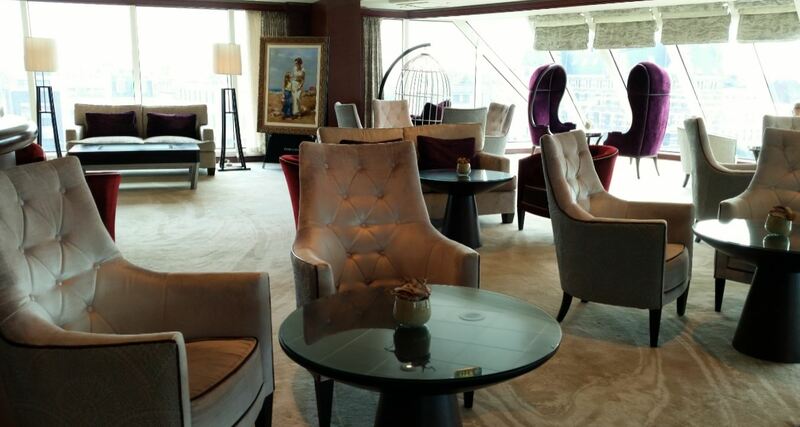 The intimate Cabaret Lounge, which seats 450 guests, resembles a cabaret nightclub with a bar and cozy tables. 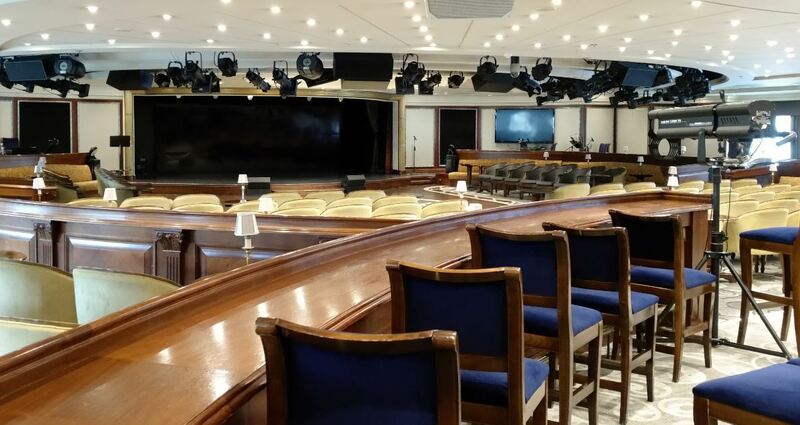 It is the ship’s location for Broadway-style shows, guest performances and Azamara Quest’s own in-house band. 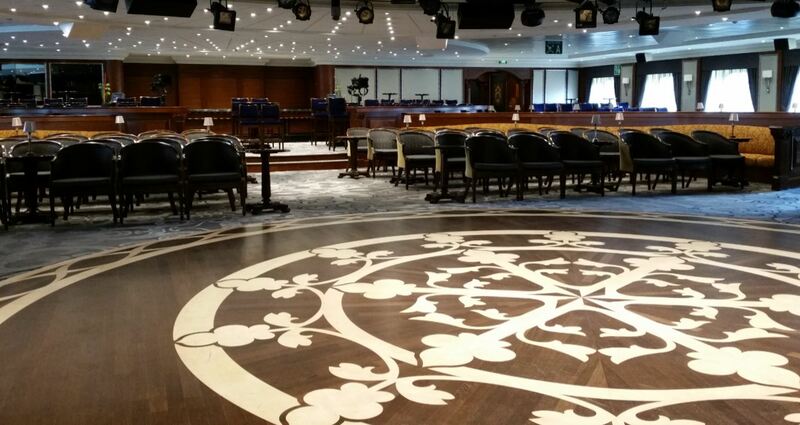 The Cabaret Lounge has the look and feel of a glamorous ballroom with a hardwood dancefloor, with inlaid floral motiv. 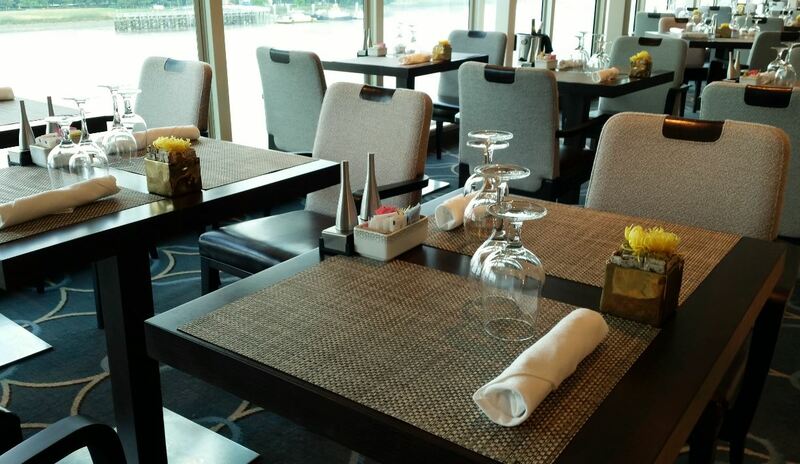 Next stop was the Discoveries Bar and Restaurant, located at the back of deck 5. 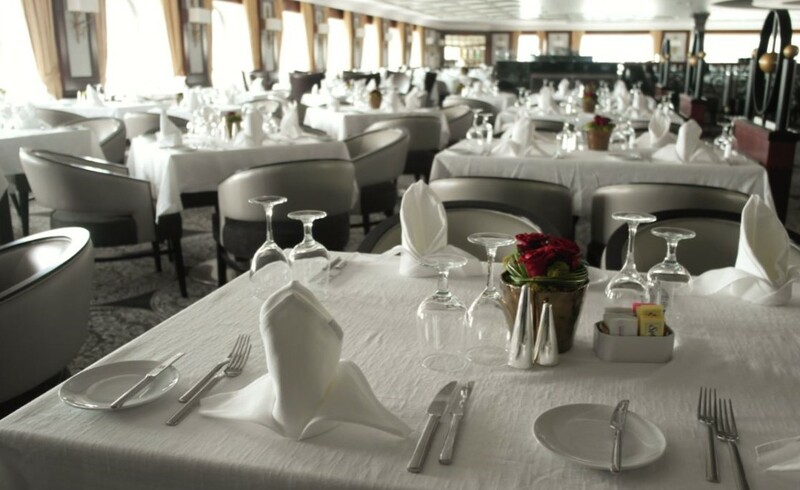 Azamara Club Cruises offers open seating for dining in the main dining room, and therefore there are no assigned dining times. 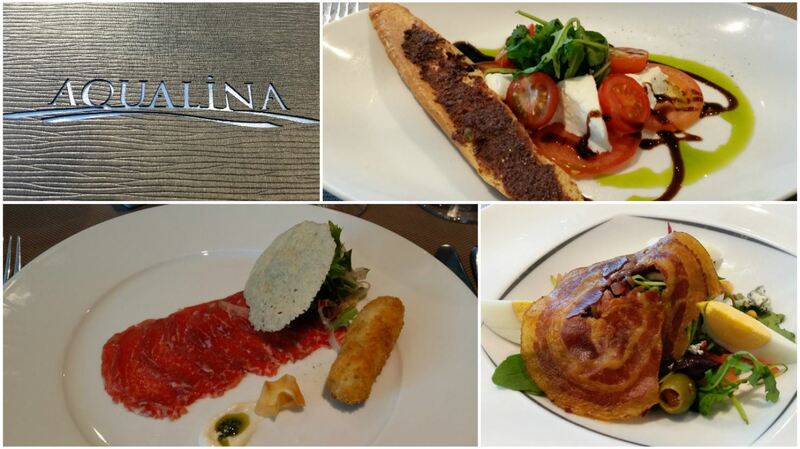 From sunrise to midnight, Azamara serves an endless array of cuisine. 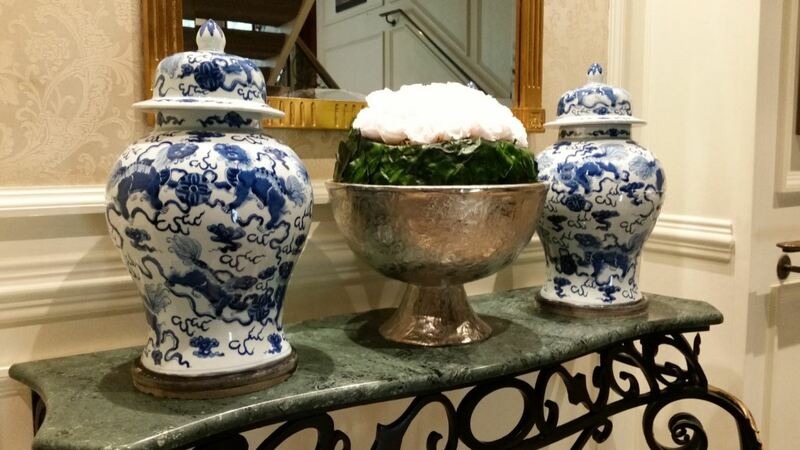 We left the restaurant and took the elevator up to deck 9 where we visited the Sanctum Spa. While some gueste were trying to work off the calories from last nights dinner in the fitness center, we walked through the Sanctum Salon to go outside to the Sanctum Spa Terrace. 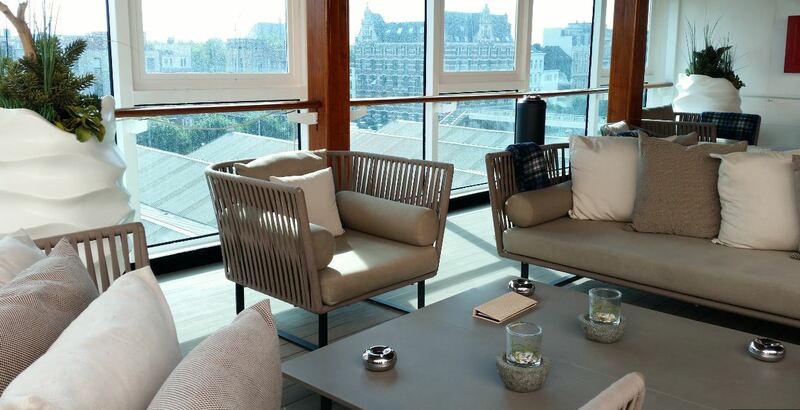 Looking out over the bow of the ship, the Sanctum Spa Terrace is exclusively (as in complimentary) reserved for suite guests and offers loungers and a bubbling salt water bath with powerful jets. Non-suite guests can get access by purchasing a day pass or a pass for the duration of the cruise. We left the peace and quiet of the Sanctum behind to have a look at the pool area. 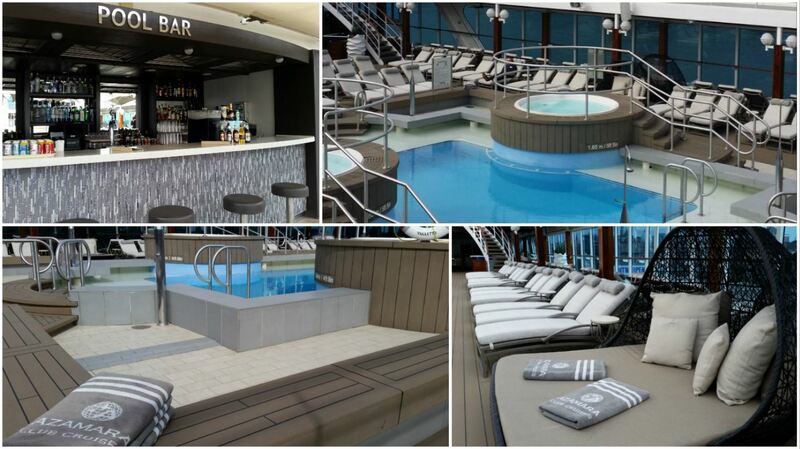 Here is where you’ll find the main (and only) pool on board, two jaquzzis and plenty of luxury lounge chairs. 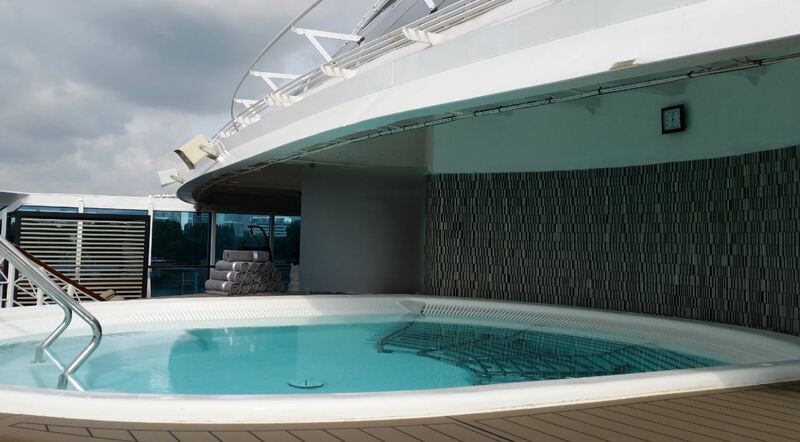 Azamara ships are non-smoking ships with one designated smoking area located on the forward port side section of the pool deck. 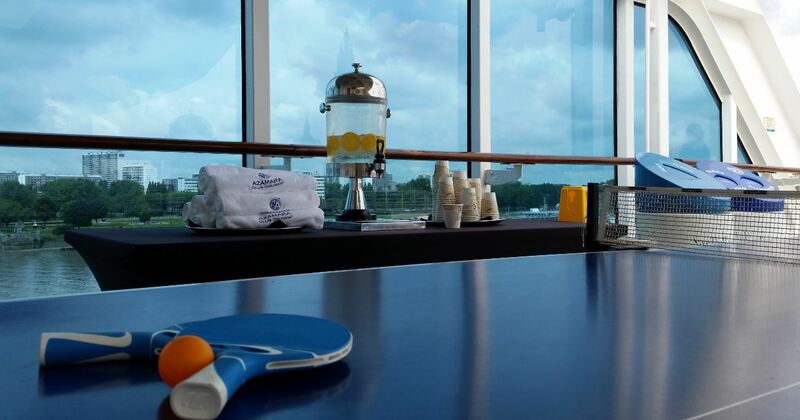 Fancy a game of table tennis? Towards the back of the pool area is a self-serve frozen yogurt station, Swirl & Top, and The Patio, a casual “pool grill” during the day which transforms in to a sit-down al fresco dining experience in the evening. 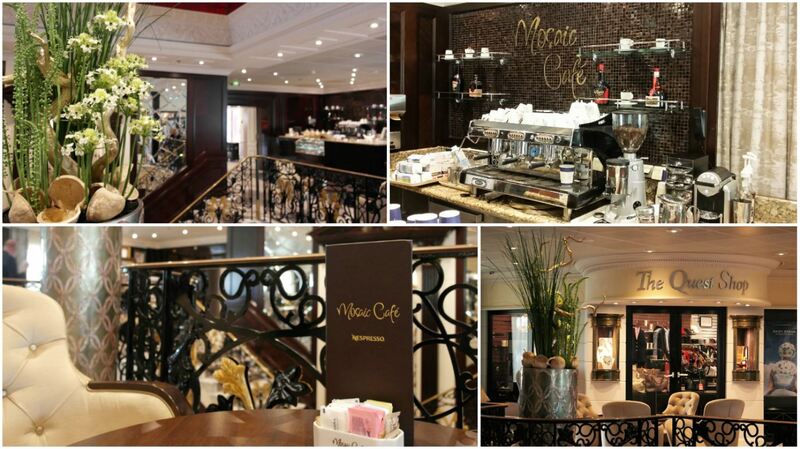 The Patio leads into the Windows Café, the buffet onboard Azamara Quest. It offers everything from fresh sushi, stir-frys and pastas to salads, smoked lox and other cold fish, a carving station and… desserts. All the way at the back of the deck is the Sunset Bar, a great spot to relax and do some whale watching during the day and sunset spotting at night. 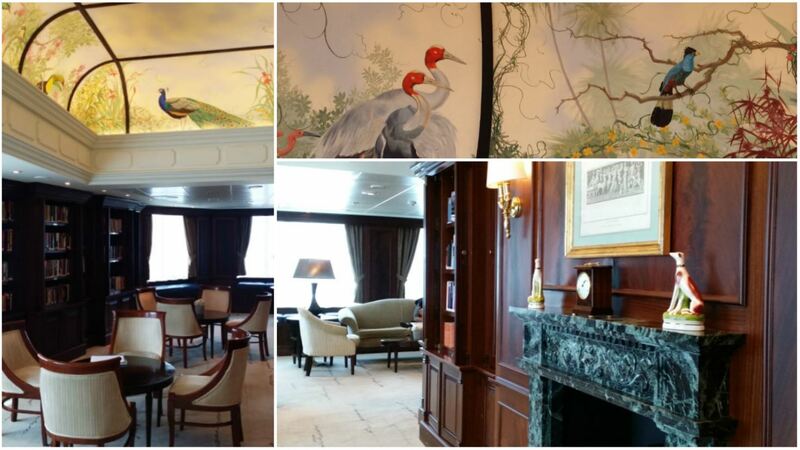 As we went back inside and up the stairs to deck 10, we found ourselves in front of The Drawing Room, the onboard library. A quick run on the jogging track, overlooking the swimming pool, and we arrived at The Living Room. 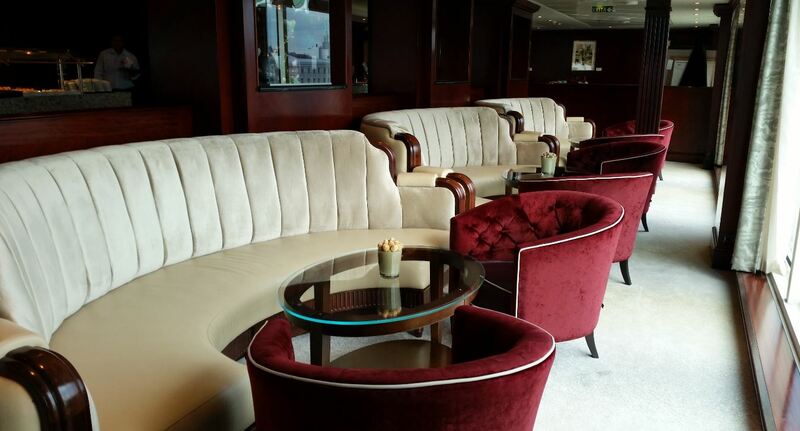 All the way at the front of the ship, The Living Room is furnished as an elegant living room, with clusters of large comfortable chairs and sofas offering, what could be described as, the best views in the house. 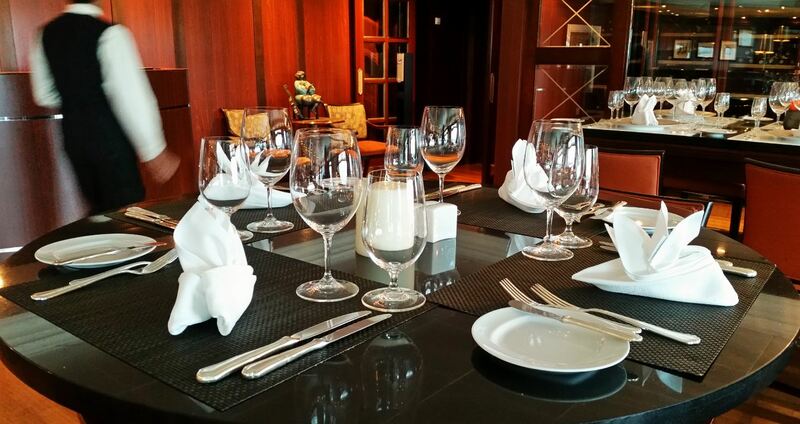 Our final stop before going to lunch was Prime C, Azamara’s classic wood-paneled steakhouse, one of the two specialty restaurants on board. While dining in the specialty restaurants is complimentary for suite guests, a $30 cover charges applies for non-suite guests. 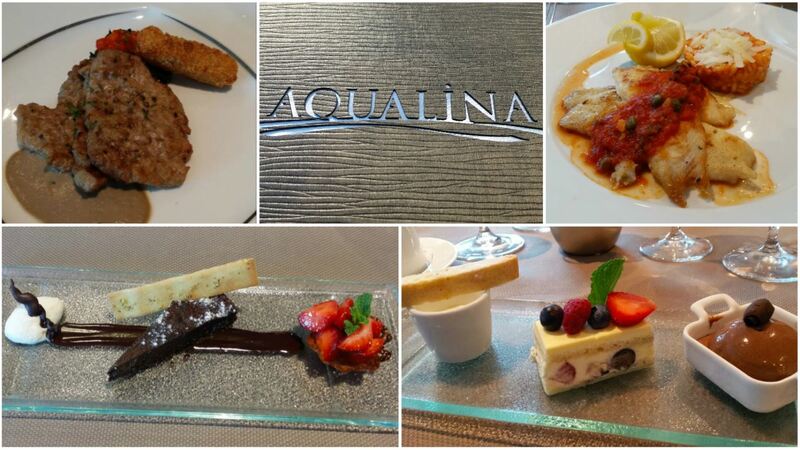 We concluded our visit to Azamara Quest with a lunch in the Aqualina restaurant, the second specialty restaurant on board Azamara Quest, serving Italian cuisine. For starters we chose Pomodore e Mozzarella (buffalo mozzarella), Carpaccio di Manzo (carpaccio of beef tenderloin with parmesan croquette) and Insalata di Rucula e Radicchio (arugula, radicchio, boiled eggs, blue cheese and caramelized red onions drizzled with Cabernet vinaigrette). As main course we decided on Scaloppine di Vitello (sautéed veal scaloppini) and Sogliola Puttanesca (sole filet with sun-dried tomato risotto and puttanesca sauce). For dessert we picked Torta al Cioccolato Senza Farina ( flourless chocolate torte with ginger-marinated strawberries and balsamic mascarpone cream) and Berrymisu (chef’s tiramisu, berries & Bacardi). 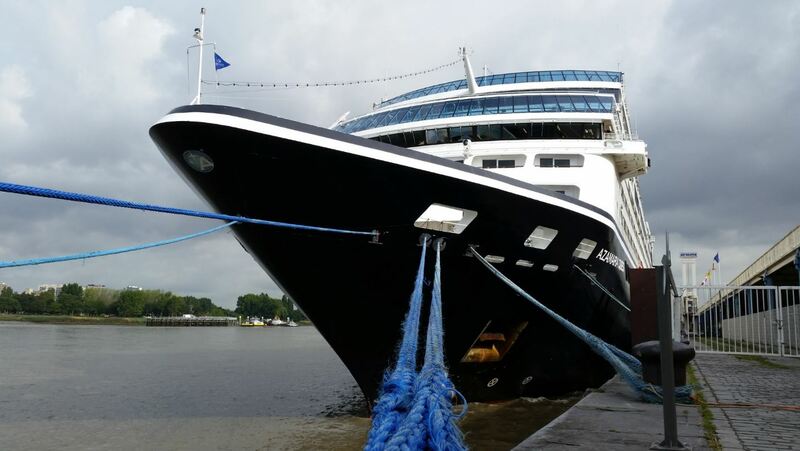 Having visited Azamara Quest as a first introduction to Azamara Club Cruises we have to admit that the people who told us we would like the cruiseline and its product were spot on. We absloutely love what we saw. 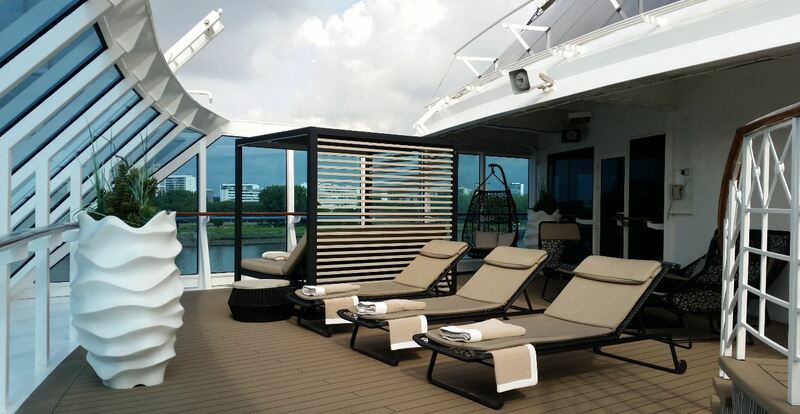 The revitalised Azamara Quest looks absolutely young, modern and fresh, combined with a timeless grandeur not often seen in younger ships. 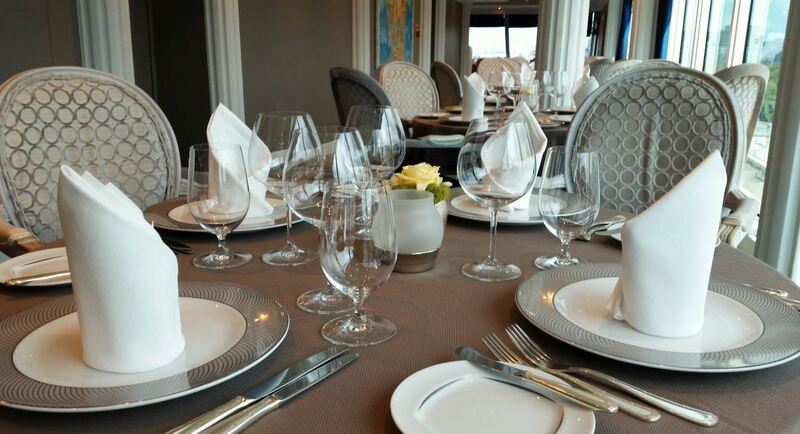 As we mentioned before the upscale luxury on board an Azamara cruise ship comes with a certain price tag. Keeping in mind that the price for a cruise with Azamara includes not only ocean transportation, ship accommodation, entertainment and meals, but also a broad selection of beers, wines and spirits, as well as soda/soft drinks, gratuities for the stateroom attendands, bar and dining wait staff, and a self service laundry, we might find ourselves on board Azamara Quest or Azamara Journey sooner than we think. 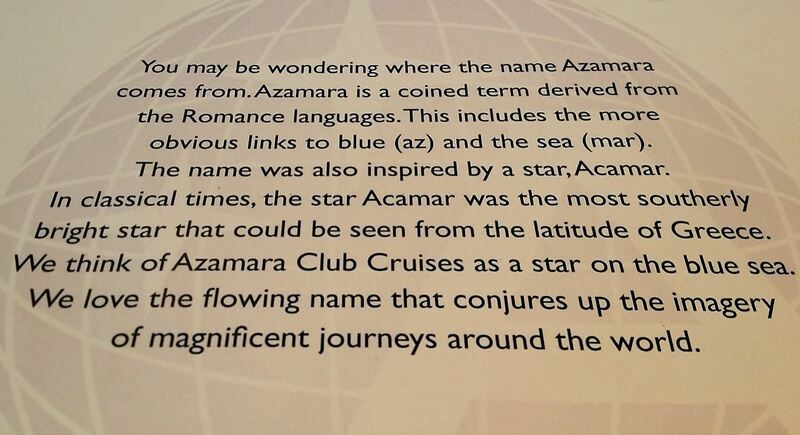 Our visit was made possible by azamaraclubcruises.com and cruiseconnection.be.